Finance provided by RCI Financial Services. Subject to status. Image shown for guidance purpose only. Over 18s only. Terms and conditions apply. 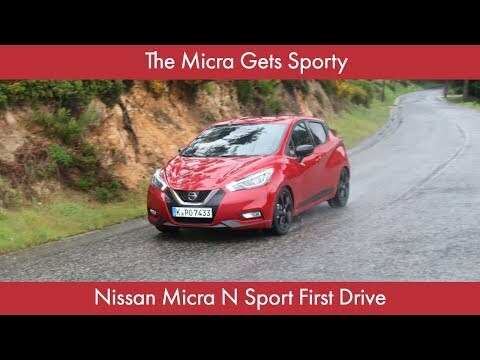 Westover Nissan are excited to present to you the slick and sporty Nissan Micra N-Sport. The three main aspects that gives the Micra N-Sport the wow factor are its agility, its fantastic selection of technology to keep you connected on the road, and of course its style - the N-Sport is being offered in a variety of colours! The Nissan Micra N-Sport has been designed to impress, and that is exactly what it does! If you would like to find out more or book a test drive then please visit Westover Nissan where a member of our highly expert sales team shall be more than happy to assist you and answer any questions or queries that you may have. Alternatively, please fill out the form available on this page and a member of our team shall be in touch shortly. *Offer valid until 31st March 2019 at participating dealers only and subject to vehicle availability. Finance provided by Nissan Finance, Rivers Office Park, Denham Way, Maple Cross, Rickmansworth, WD3 9YS. Subject to status. Guarantees and indemnities may be required. You must be at least 18 and a UK resident (excluding the Channel Islands). Terms and conditions apply, please visit www.nissan.co.uk/offers-termsandconditions or your local dealer for full details. MINIMUM 20% DEPOSIT REQUIRED AND IS ONLY AVAILABLE ON N-SPORT IG-T 100 GRADE. Offer based on 8,000 miles pa, excess mileage 8p per mile. Offers not available in conjunction with any schemes or other offers. Vehicle price includes first registration fee and 12 months’ road fund licence. Terms and Conditions: *Offer valid until 30th June 2019 at participating dealers only and subject to vehicle availability. Finance provided by Nissan Finance, Rivers Office Park, Denham Way, Maple Cross, Rickmansworth, WD3 9YS. Subject to status. Guarantees and indemnities may be required. You must be at least 18 and a UK resident (excluding the Channel Islands). Terms and conditions apply. Please refer to your local authorised Nissan dealer for further information and exact specifications. Offer based on 8,000 miles pa, excess mileage 8p per mile. Offers not available in conjunction with any schemes or other offers. Vehicle price includes first registration fee and 12 months’ road fund licence. Westover Group act as a non independent credit intermediary. We can introduce you to a limited number of lenders to assist you with your purchase, who may pay us for introducing you to them.